← A walk from my Garden. I’ve made good progress with my Down the Rabbit Hole quilt, I got a bit behind but this week I finished appliquing all the leaves and today I finished all the houses! I think last month I was debating whether to add some more leaves, well having spent quite a few evenings stitching them all on, I decided I had sufficient, I can always add some later if I feel the need! It was reassuring that I could see the improvement in my leaves as I stitched them. Once I got the knack of only turning a tiny amount at once and holding it down with my thumb nail I cracked it. The next task to give me a bit of stress was trimming the centre to the correct size, I’d left a bit spare to allow for fraying and I knew I had to make sure it was accurate. I had to double check that the middle of the circle was in the centre of the square, I must have checked the measurements about 10 times, including the diagonals (my dad was an engineer, somethings you never forget…check the diagonals!) before I finally trimmed it. Adding the mitred border was easy after that! Sarah included really clear instructions on her video on how to get a perfect mitred corner, it must have helped as they came out pretty well! A stressy bit again, Sarah strongly encourages us to cut away backing fabric behind applique due reduce bulk when you start quilting. It was with some trepidation that I pulled the glue spots on the centre wedge away from the backing and cut away behind. I confess though I haven’t cut away behind the flowers, that was like one step too far!! 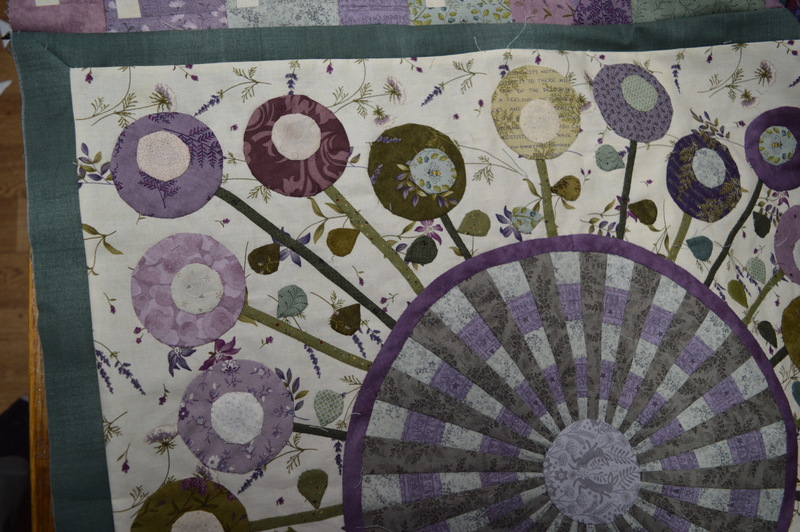 As soon as I cut the centre away I laid the quilt as flat as possible and stitched the centre of the rabbit hole, I wanted to make it stable straight away. I found some of Lewis & Irene’s Spring Hare fabric in silver grey, it’s the same print I used in my Splendid Sampler quilt with pink hares on. I think it’s perfect for the centre and I’ll be using it to stitch rabbits with on the outer border. So this was the official photo for the end of month three! The houses were fun to do but they did take time, after all there’s forty of them! 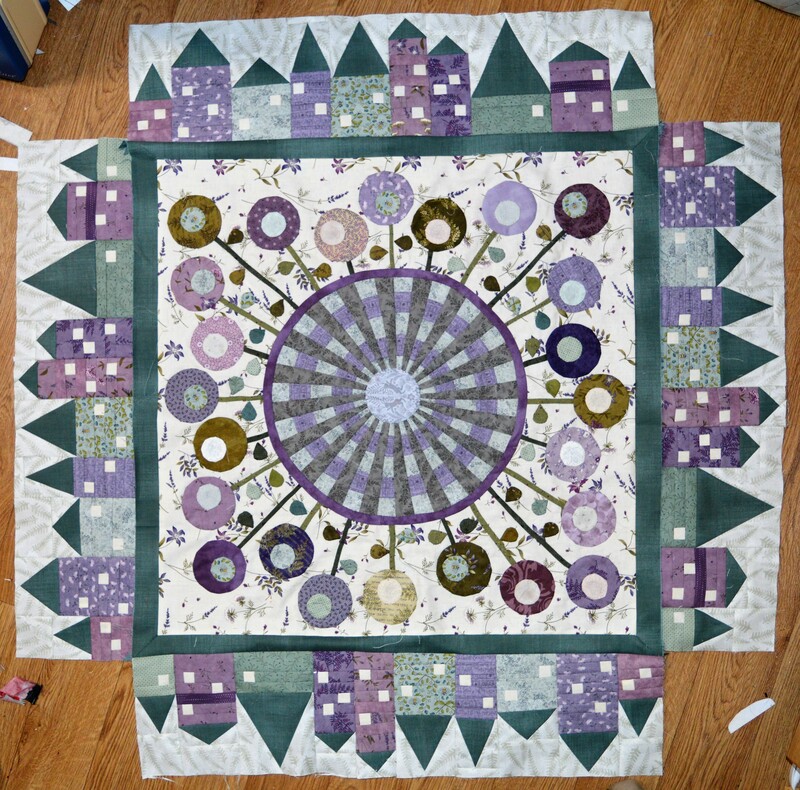 The roofs are paper pieced which after the Splendid Sampler quilt, doesn’t faze me at all. The main houses were fiddly with all the little windows. I did have a few issues with the builders!! I nicknamed the row Coney Lane. Number Four, the Old School House, was clearly built around 1750, one window is blocked up due to the window tax, the foundations weren’t quite deep enough, maybe due to a lack of building materials, so Capability Brown had to create a higher hill behind! I think the builder needed to go to bed! I tended to cut the strips slightly bigger than I needed to allow for trimming, I always tried to start sewing at the same side so at least one edge would be straight….so I don’t know what happened here, this one thinks it’s the leaning Tower of Pisa! Luckily I had enough spare to straighten it up. At first I left myself a little spare in the height of the cottages, thinking it may help, I stitched them all from the bottom, it was only after I’d stitched 1 to 6 together that I realised the Beekeepers Cottage and Heather Cottage (Numbers 5 and 6!) had no leeway above them and they were too tall, so out came my friendly stitch ripper and after that I trimmed them all to the correct height before I stitched them together. It was with some trepidation that I measured the finished rows of cottages, to my amazement they were all the right length, so I’ve stitched two on and the other two will be attached as part of this months work, making suns for the corner squares. I’m really enjoying this quilt-a-long, it’s certainly pushing me out of my comfort zone, but that’s how you learn isn’t it? It’s been great seeing all the different colour schemes on facebook, ones with midnight blue backgrounds, a lovely one in about 36 shades of grey and an amazing one which is like a colour spectrum going round the quilt. This entry was posted in Down The Rabbit Hole, Serendipity and tagged applique, Down The Rabbit Hole, Foundation Paper Piecing, Quilting, Sarah Fielke. Bookmark the permalink. You’re being so meticulous, but it’ll definitely pay off in the long run. Little things have a nasty habit of escalating as you go on! That Spring Hare fabric is wonderful, such a brilliant choice! I’m trying Kate 🙂 I’m triple checking sizes at the end of each block as Sarah keeps stressing how important it is with a medallion quilt – as you say, a little discrepancy gets bigger and bigger!! The border looks fabulous – I can’t see any problem with the colours at all – I can’t even tell which one is no. 9. 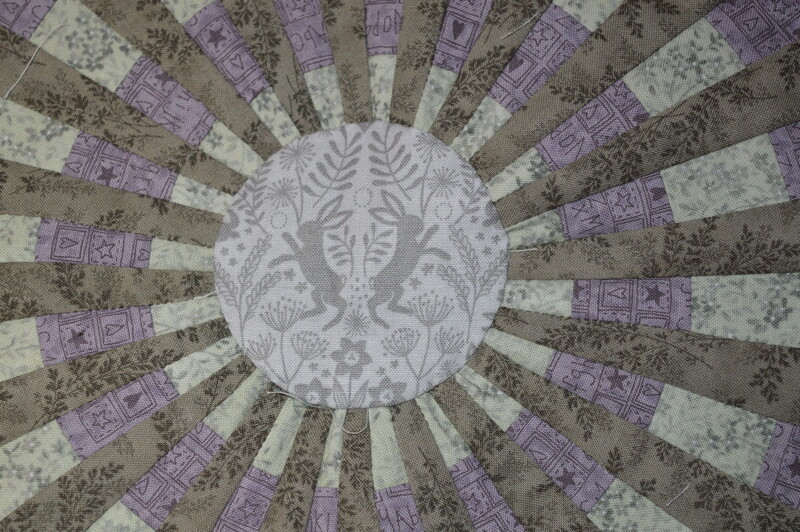 The spring hares in the centre look just right – I bought a FQ bundle of that range and haven’t used much of it yet as I can’t bear to cut into it. Thanks Tialys, I love the spring hares fabric, they’ve bought another rabbity one out too which I’m trying to resist! Thanks Debbie, I started off with a layer cake of ‘The Potting Shed’ and then added to it. I really like the colors. Purple is turning into one of my favorites. I can’t wait to see it finished! Thank you, I’m very much a purple person, I’m ahead of my years for the poem ‘When I grow old I shall wear purple’!!! It is looking just marvelous Margaret! Does it include a quilting plan, or are you left in your own for that? Thanks Kathy! I’m not sure about the quilting, but I think we will probably be left to do our own thing. 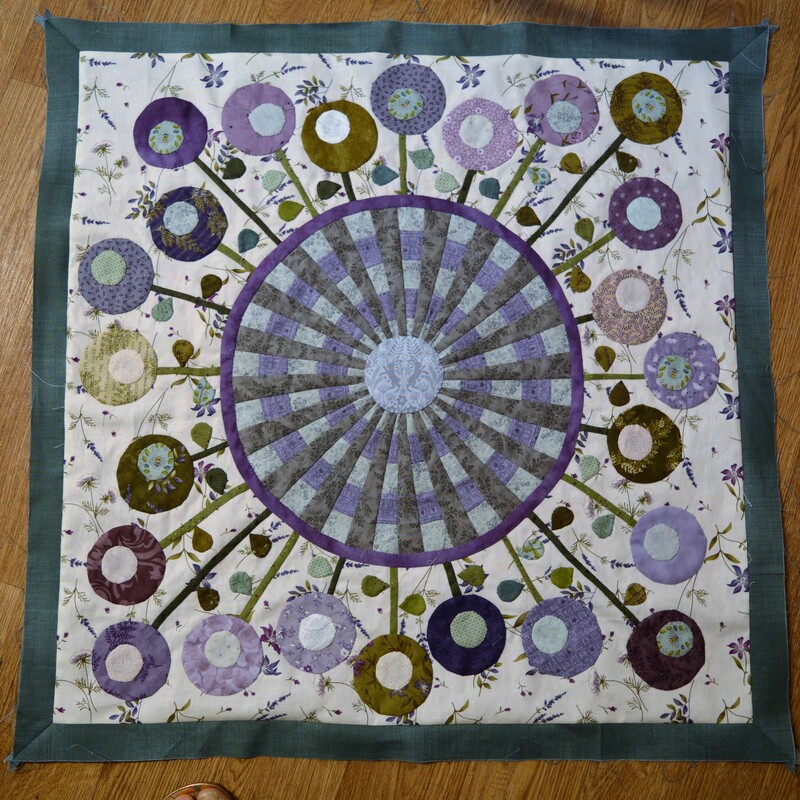 I’m actually thinking of getting a local long arm quiter to quilt it as it will be queen size so I would struggle to quilt it on my machine.